This decorative starfish pillow has a gorgeous design and beautiful colors, making it a perfect addition to any room. Every pillow from Floor Bloom is top-of-the-line quality. The super soft valboa fabric has reinforced backing for durability. Seams are double-stitched and attention to detail is paid in every part of the design. This pillow is 100% hypoallergenic polyester and stuffed to perfection. Machine washable. 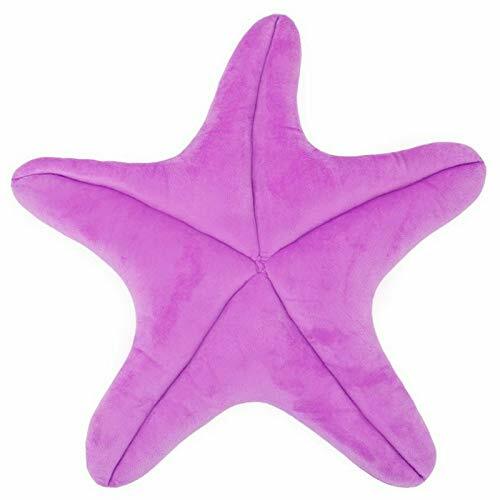  BEAUTIFUL IN ANY ROOM - The bright purple color, whimsical shape and detailed stitching make this starfish pillow a stunning addition to a bedroom, living room, playroom or any other gathering space.  SO MANY USES - At 2 feet x 2 feet, this starfish pillow is a perfect size decorative pillow on the couch or bed or it is just right for kiddos to use while sitting or playing on the floor. Your favorite little mermaid will love the starfish shape and the imaginative play that it invites. ⭐ MINKY SOFT - Made with minky soft valboa fabric, this starfish pillow is so cozy and comfy that it will become an instant favorite for cozying up with. Grab a book, a cup of tea, or a good movie and make sure your starfish pillow is there for snuggling! ✅ EASY TO CLEAN - Floor Blooms were designed by a mom so you know they are machine washable! The hypo-allergenic, valboa material used for each starfish pillow is machine washable and easy to spot clean so you can keep this pillow looking new for years.  HIGHEST QUALITY - Every starfish floor pillow is top-of-the-line quality with double stitched seams and lined fabric, making them an incredible value and one that is built to last. Guaranteed to be a favorite addition as soon as this beautiful pillow is delivered!